The Tata Safari Storme which was essentially a facelifted Safari was first showcased at the Auto Expo 2012 with sales beginning shortly thereafter. However, the Safari Storme didn't exactly set the sales chart on fire like the original SUV did. This was attributed to a high asking price and not so nimble dynamics. 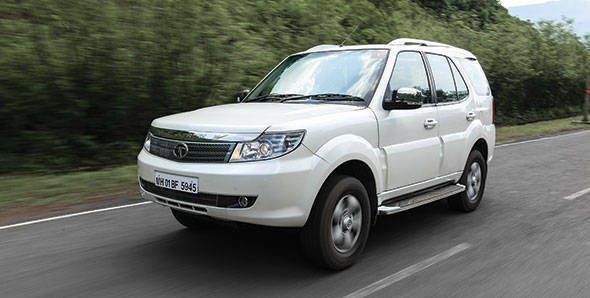 However, Tata Motors is now ready with a new Safari Storme. The SUV has undergone extensive revisions according to our sources as well as now offers more equipment. Sources close to OVERDRIVE tell us that the Storme facelift has been re-engineered based on feedback from internal staff, customers and people in the know-how. Spy images of the new Storme show a revised bumper and grille while overall the silhouette of the SUV remains the same. Inside the cabin is where major revisions are said to taken place. The new Tata Safari Storme will have an updated infotainment system, dashboard and upholstery. The last row of seats, breaking away from the Safari tradition, are expected to be front facing. There are spy shots on the internet which also suggest five seater variants. Under the hood, the new Storme will borrow the Aria's more powerful 150PS/320Nm engine. It will however be mated to a five-speed manual transmission. There will be no automatic variant in the offing as well. Tata Motors is also said to have worked on the vehicle's chassis to improve its ride and handling, especially the latter in the city. The general customer feedback was that the Safari had a huge turning radius as compared to competition like the Scorpio and now the Duster and was cumbersome to drive in the city. As compared to the existing Safari Storme, expect the facelifted SUV to be priced very competitively. Tata Motors is expected to launch the new Safari Storme within the first half of 2015.